Have you met the new MetLife today? MetLife Inc, America's biggest life insurer, held a celebration for the launch of its newly named joint-venture (JV) life insurance company in Shanghai on May 19. The ceremony is part of an on-going effort by MetLife to brand itself for the Chinese market. 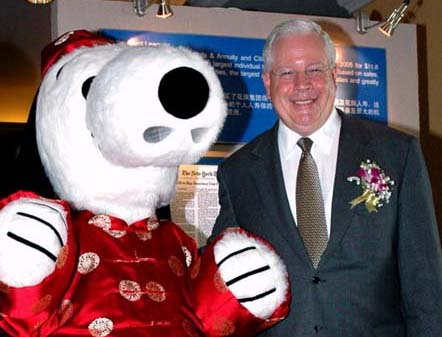 Although legally allowed to use CitiInsurance's trademark of a red umbrella until June 30, United Metlife has already made the switch to their own Snoopy mascot in an effort to make the transition of the JV from CitiInsurance Life Insurance to MetLife more palatable to the public. MetLife holds 50 percent of the JV, United MetLife Insurance Co, and its Chinese partner, Shanghai Alliance Investment Ltd, an investment arm of the municipal government, own the rest. The JV, formerly CitiInsurance Life Insurance Co Ltd, dates back to August 2005 and was formed with US$62.3 million in registered capital. In January 2005, MetLife Inc acquired Travelers Life & Annuity from Citigroup, which included CitiInsurance international assets, for US$11.5 billion. Since brand names are especially important in the insurance industry, the name Citigroup actually means much more to Shanghainese than MetLife, though the latter is the largest life insurance provider in the United States, an insurance analyst said. Citigroup boasts more than a hundred years of history in Shanghai, setting up its Shanghai branch one year after its establishment in New York in 1901. MetLife opened its representative office in Shanghai just ten years ago. MetLife delayed renaming the JV until 10 months after the initial acquisition partly because of this, according to the analyst.